As I look back on 2011 I am overwhelmed with gratitude and joy… I absolutely love what I do! 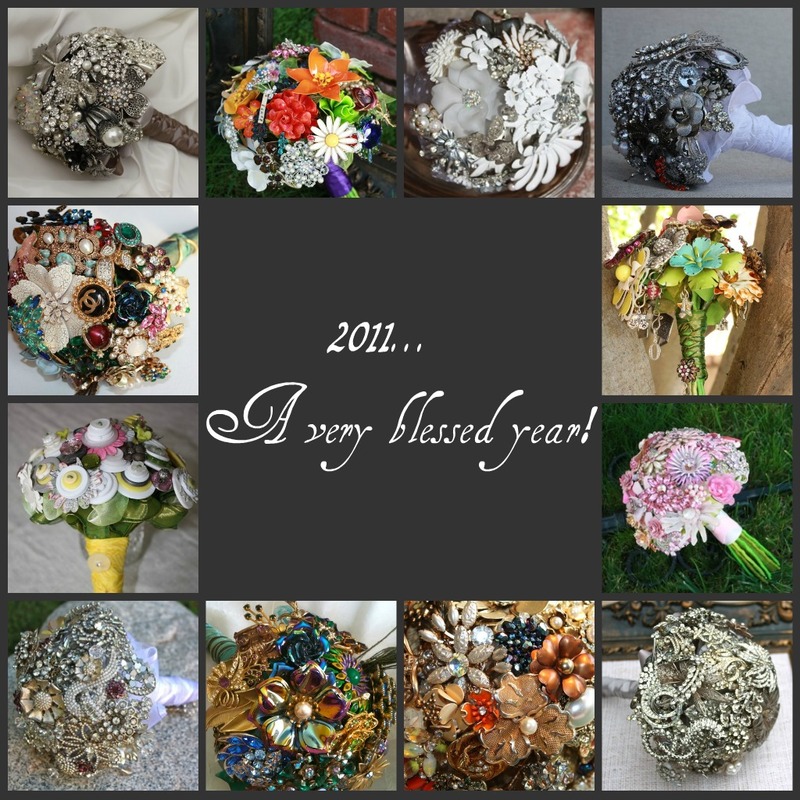 I thought I would wrap up the year with some fun studio stats, Enjoy… Over 600 brooches used, 96 yards of ribbon, 360 yards of floral tape, 2 Countries and 11 States shipped to, from New York to Hawaii and Gibraltar. One name change, 59 Blog posts, over 9000 blog views, approx 117 new friends and followers on Facebook and Twitter, Opened a new Etsy shop with 7,869 views to date. WOW! And that is just the nutshell version. I can not thank all of those who have supported me in this new adventure, I am truly blessed! Thank you, thank you to my Brides who trusted me to create their Brooch Bouquets! You all Rock and I am so grateful for your business and encouraging words! From the bottom of my heart, I wish you a very Happy and Blessed New Year! 2012 I’m ready! Nancy, I am so proud of you as a women business owner, wowed by what you make with your hands and amazed at what you have learned in just one short year. Your clients can always trust you to come through with something beautiful, you love what you do and it shows. God has blessed you with a gift – may He bless you tenfold in 2012!!! Awe, Thank you Stacie for being such a great encourager and sounding board! I love working along side you and Gatherings! We are blessed indeed! Now bring on 2012!